With just a couple of days to go before practice in Melbourne, the time for predictions has arrived. F1 Fanatic has a post asking some very interesting questions regarding the coming season and I got into trouble for daring to pick Heidfeld as champ this year. As I pointed out in my reply, yes, I am sticking my neck out on that one but any prediction for champ has to be a stab in the dark this time. Most are going for Raikkonen as usual but that relies on several factors that aren't decided yet by any means. It is reasonable to think that the Ferrari will be quick, judging by testing times, but it does not look like the fastest car to date; that honor goes to the Brawn BGP 001. And then there are Ferrari's reliability and pit stop shenanigans to consider - it is a bit of a gamble to bank on them being any better this year than last. And then there is the minor matter of Rakkonen's motivation; has he really woken up and decided to give it a go this time? He may have lost some weight but that has little to do with attitude. Kimi has shown that you cannot rely on him turning up for the races and I think that may be a problem that gets worse, not better, as the season wears on. That is even more likely if the car turns out to be less competitive than expected. If the team end up struggling to get on the podium and retiring with mechanical faults more often than they should, I can see Kimi becoming fed up and walking away. He has done his time in difficult cars and is hardly in a mood to deal with such problems at this stage. As for those predicting a Button or Barrichello championship, I salute their optimism. It is a fair bet that the Brawn GP car will be quick from the outset but, even ignoring the result of protests from the others, the team will find it hard to keep it out in front. Reliability will be a big factor in the equation too, the BGP having had less running than other cars in testing, and I think it is asking too much for a Brawn driver to become champion this time. They will do well but not that well. There is always that man Alonso to take into account, of course, and he is gathering his loyal votes as usual. That Renault is highly suspect, however, its testing times having been so varied; I would guess that the team will find it hard to keep up to begin with and not come good until late in the season. Fernando will gain a few surprise wins but I really cannot see him challenging for the championship. Hamilton's chances have been scuppered by the weakness of the McLaren this year. Historically, the team has produced the occasional dog and it looks as though they have managed it again this year. The car will improve as the aero boys get to grips with the problem but not quickly enough for Lewis to stay with the leaders in the title hunt. He might win a few races late in the year but most of his time will be spent in proving that he can get a poor car further up the grid than it should be. What other possibilities are there? One brave and romantic soul has gone for Rosberg and I must admit that I would love to see him do it. But the Williams, although quick, has not really blown the others away in testing and the usual problem of staying with the pace of development will probably see the team slipping backwards in the second half of the season. It would be nice to see Nico bag a win or two, however. Another prediction that we must surely put in the optimistic or facetious category went for one of the Sebastians. It is good to see someone else throwing a cat amongst the pigeons but this one is truly wild. So far the Adrian Newey design has seemed little more than competent and even the over-rated Vettel will find it hard to squeeze a win out of it. Which all means that I have to return to BMW for my prediction. My guess is that the car is better than we have been allowed to see so far and that it will have a slight edge over the rest, including the Brawn. There is a lot of optimism mixed up in that, I admit, but it is not entirely unreasonable. In fact, it is in line with what we have come to expect from the German/Swiss team - no flash or hype, just sound development of a good design and letting the results speak for themselves. As to the battle between Heidfeld and Kubica, I have said enough in the past for my readers to know that I expect Nick to be the winner this time. 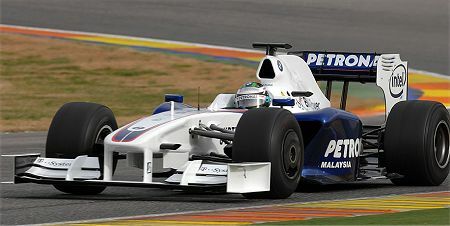 The car suits him much better than last year's and he was never far behind Kubica's lap times in the 2008 races. Good speed plus a wily tactical brain will see Nick emerging as BMW's surprise star this year. So my prediction is Nick for champ and BMW for the constructors' title. That is probably the kiss of death but hey, I have to go for someone. As an aside, notice that no one has gone for one of the Toyota drivers as yet. The car has been fast in testing and boasts one of the controversial diffusers so it might have been a good outside bet to produce the WDC. The problem is that it is hard to see either Trulli or Glock as champion; they are both quick but the consistency is lacking. One can only hope that the team does well enough to keep them in the game in future years. What it all amounts to is a very open championship. Any prediction has to be much more of a guess than in previous years, thanks to the changes in regulations, and the number of drivers to pick from is huge. Commentators are still going for the old favorites but my hope is that we will see a massive shake-up with some unexpected results confusing the issue. And it all begins in Melbourne in only a few hours; all our questions will not be answered immediately but we will have a better idea of how things stand after the race. Let battle commence! So, where do I stand? The short answer is that I don’t, since I’ll be sitting on the fence this season till I see which way the wind blows. Only the very brave would do otherwise ... at least till post - Australia. Sometimes, predictions is just a matter of faith mixed with some reasoning. You predictions, Clive, have more reasoning than faith, but some guys can´t free yourselves from conventional wisdom. I have gone with you in point out Nick as the favorite to 2009, I´m not sure about Kubica yet, and I believe, as you do, that this car will be a rocket when touch the track at Melbourne. There has never been a season before where I have got this close to the start of the action and not had the slightest idea what is going to happen. Hamilton could be fastest by a second or slowest by a second in the first session and neither would surprise me. I think Kimi is going to deal with Massa this season. The new cars should be a bit tail happy which Kimi will enjoy and Massa will not. I don't think Kimi's motivation was ever the problem but if it was give him a fast tail happy car and his motivation will return. I just can't see BMW winning a championship. They have yet to win a race on the track. I know they won Canada last year but given that Lewis took out Kimi when bothe were faster than Kubica it was not a straight victory. We have to see how the team copes when expectation rises and they have to win and if Heifeld gets the upper hand which he may well do we have to see how Kubica responds and how the intra-team politics play out. Kubica like Massa and like Alonso will not like the new cars ahving more front than rear grip. They like cars that understeer and I would not be surprised if the reason that Renault uniquely hasa fat nose is to alter the handling more to Alonso's liking. As I said at the start I have no idea who is likely to win the first race or the championship. I am so looking forward to the first session to get a clue. let's hope for an unusual result. I've gotta go with Massa. I think Kimi will try but ultimately fall short. Lewis will be too far behind once they get their new car figured out (probably by the first Europeon race) to catch up. BMW, Toyota and Honda will be in it, but in the end won't have the consistency to take the championship. Renault...what can I say? I just don't see it coming together. For me this year, It's red all the way. excellent artical ....should be an interesting season for sure. Many of the arguments for Heidfeld also goes for Kimi. He didn't like the 2008 car and had his problems in qualifying, but was anyway faster than his teammate and everybody else in most races last year. This year car is more of Kimi's liking, so I think he will be the better of the 2 Ferarri drivers. Brawn GP will be fastest in the beginning and then I hope the flywheel KERS will do wonders for Nico and give him some podiums. In the end it will be between Alonso and Kimi. Rob: Point taken and it's a good one. But how predictable is it that the Ferrari fans will always go for Kimi or Filipe? There are even a few diehard Hamilton fans who are still backing him for the championship. ow that's what I call loyalty! Don: You may well be right but, for the sake of F1 being less than predictable, I have to go for something other than another Ferrari win. They've had more than their fair share in the last ten years and it would be great to see other teams sharing the spoils for a change. Craig: Thanks. i can only hope that you're right! Hezla: Quite right about Kimi and Nick apart from one thing: Kimi has admitted that he was not sufficiently motivated last year. We all suspected that and he was merely confirming our suspicions. The same cannot be said for Nick - he never gave up trying even though the car did not suit him at all. It remains to be seen whether Kimi has really succeeded in relighting the fire but you can bet that Nick will still be giving of his best. He's a determined little blighter and has something to prove this year. Thank goodness for "little guy syndrome"! Always a good bet, Alonso, regardless of who has the best car. I just don't think the car will be close enough to the leaders for Fernando to lift the championship. He wasn't a good bet at this time last year when I went for Kimi but I think the Renault has come good in late testing and he will adapt best to changes over the season This year will be about consistancy and reliability and Alonso has both. Oh, and Clive, when did your man last win anything, discounting Scout raffles? Change of tack. I notice in a tech. file on Melbourne that they mentioned the issue of high track temperatures here. They missed the time of day for the race and the weather forecast for the weekend. Which cars have had tyre warm up problems in testing? That might give us some clues for Sunday. Actually, the fact that Nick hasn't won a GP yet can count for him too. That's a lot of steam to have built up and the first win could really break the dam. Or he could be a Chris Amon. We'll see. That's a good point you make in your last paragraph, Leslie - the weather will have an influence too. Presumably, no matter how hot it gets it will be cooling down when the race begins. But rain? We know absolutely nothing about which cars will go well in the wet. What if it suits McLaren? Current forecast for Friday/Sat/Sunday 22-24 degrees. That's max, by 5/6 PM the temperatur will be about 2-3 degrees cooler as the Sun goes down. Sunset is 7.18 PM on Sunday. Any delays/rain, a long shot at present but Melbourne is fickle, could cause visibility problems late in the race. Returning to your outlandish (ha ha) Nick Heidfeld prediction. You say that he never got to grips with last years car as do other commentators about other drivers/cars. My view here is that the best development/test drivers can work with their engineers to get the car to suit them and if a driver doen't have that ability then he tends to lose momentum throughout the season. It's not the car, if one of the drivers can make it work for him, it's the driver/engineer combination of the non perfoming side of the team that's just not hacking it. Amon. Nick has been in much better cars than Chris Amon ever had at his disposal. I wish you both well though. Thanks for the weather report, Leslie. I usually don't bother with looking at it until closer to the races because it can change so much. But you're wrong about my saying Nick never got to grips with last year's car. i said it didn't suit him and the amount of work the team put into getting it more to his liking shows that this is true. In the end, they got it to the point where Nick was actually quicker than Kubica (which, I have no doubt, was one reason the Pole was a bit peed off towards the end of the season). As regards Amon, while he was with Ferrari he was given cars as good in their time as Nick has ever had. The proof is in the number of times he led races only to have something go wrong. "Good speed plus a wily tactical brain will see Nick emerging as BMW's surprise star this year." Now there's a sentence I can get my teeth into!!!! Your name must be an omen, Nick! Hope Lewis changed his playlist this time around, included some oasis or radiohead that could save him some misery he's gonna go through with the lousy McLarans . ( my god, I am anti-McLaran!! Just had that revelation) . From speedtv.com: "Nick Heidfeld's BMW-Sauber F1.09, but not that of his teammate Robert Kubica, will be fitted with an active KERS system for the Australian Grand Prix weekend." I see pictures in my head of overtakings, Ferrari uses KERS to overtake Brawn GP on place and they fight back later because they are in general quicker. Hezla: The fact that BMW are running Heidfeld with KERS and Kubica without is very interesting. We can draw all sorts of conclusions from it but it makes it clear that driver weight is much more important this year than ever before. Whether it gives Nick an advantage is a debatable point. He will have the luxury of extra power to overtake but Kubica will have more ballast to play with. In his interview with Autosport, Nick says that it does not make much difference - a case of swings and roundabouts, I think. I agree that running KERS and non-KERS cars could lead to situations where a car gets passed at one point in the lap, only to be re-passed somewhere else. It has to be a slight advantage for the KERS car, however, in that it can power past on a straight whereas the non-KERS car has to somehow get the inside line for a corner. This weekend is going to teach us a lot!